Choosing boots for your dog is easy once you know how. Get tips from our Two Minute Dog Advice columnist Wendy Nan Rees about finding the right size and style of boot to protect your pet's feet. Here in southern California, we don't tend to see snow. However, winter can be brutal in other parts of the country. This is not only true for people, but for their companion animals as well. Dog clothes can be appropriate under the right conditions, especially when you may need something to protect your dog's foot from an injury or after surgery. In cases like this, a boot is a wonderful invention. 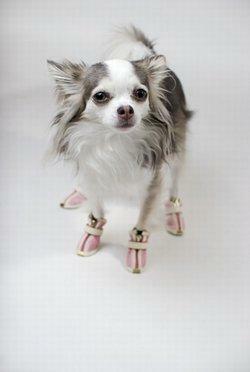 Dog boots are also good for winter climates where salt is used. Depending on the boot you pick, they can protect your dog's feet from salt, sand and other chemicals that might be used to deal with the snow and ice. The premise is the same although some boots are better for severe weather than others. Even dog sledders use boots to keep their dogs' feet safe, warm and dry. First things first. How do you size a dog's foot for a boot? Believe it or not, the best way to size your dog is to take him to the store with you, and have him fitted. If you can't take your dog to the store, the next best thing to do is have your dog stand up on put a piece of paper, and measure around his feet with a pencil. Just like fitting your own shoes, you want to make sure there is enough room to accommodate his entire foot, including his toe nails. You don't want them to puncture the boots the first time you get them on them. Now to the boots, their materials and the different styles they come in. Naturally, boots come in sets of four, and the oldest design is a plastic boot with a piece of elastic that snaps around the top. The biggest challenge with this style is that while they will keep your dog's feet the driest, they are also the easiest to lose. The reason for this is that for the boot to fit a dog's foot, his foot has to fit down the leg of the boot. Therefore the shaft, or leg, of the boot is almost as wide as the space where the dog's foot goes. There is also a leather boot style that is made from a single piece of leather. There are two holes in the front of the boot for the dog's center toes. The center toes go into the space and the tongue of the boot is pulled up the middle. The two sides are then laced together. This is the style of boot that hunters have used for years because it is a rather thick boot that protects the dog's feet from anything he might step on, short of a nail. It is time consuming to put on, and if you are trying to take the dog outside to do his business, he could end up dancing from foot to foot trying to hold it. In cases like this, you might want to try another alternative. Each set of Doggie-Sox™ has suede leather soles and knitted, elasticized legs. They are held on the dog's body by suspenders that work very well. They can provide traction, and are good against snow, ice and salt. They'll also keep your dog's feet clean when you have to walk your pet in the rain or on muddy ground. These boots can also be used to protect your dog's foot after a surgery or to protect a foot that has been injured. They come in three sizes and are available directly from the manufacturer. Nylon and polar fleece boots tend to be of the same basic design, except the materials used to make them are different. One of the nicest features about these boots is that they use Velcro™ to keep the boot closed on the dog's leg. This feature is very nice because it makes the boots easy to put on and adjust. Polar fleece is good for cold weather and snow, but it can get wet rather quickly. The nylon doesn't have the challenge of getting wet, but it also doesn't offer much warmth. For these reasons, some people will buy both a nylon set and a polar fleece set, and put the nylon set on over the fleece. This way the dog's feet are kept cozy and dry. So, dog boots aren't just for dressing up. In some cases they can be really a helpful tool for keeping your dog safe.